Six Lions from the Fond du Lac Evening Lions Club volunteer to transport eye tissue for the eye bank. 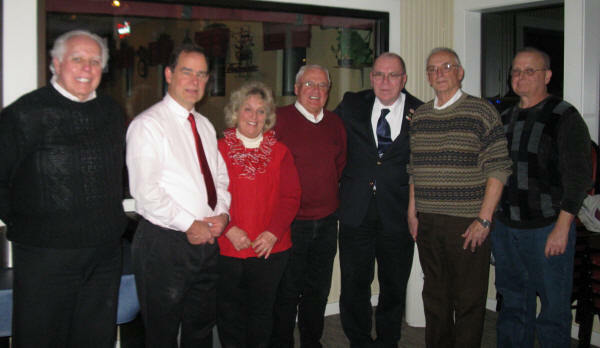 Pictured are Ed Barnes, Tom and Betty Clausen, Erv Karls, Phil Weber, Director of the Lions Eye Bank of Wisconsin and a transporter from the Sherwood Lions Club, Frank Bartzen and Wayne Bargenquast. These Lions either take donated eye tissue to a relay point in Beaver Dam or take prepared corneas up to the Fox Valley for transplantation. Over thirty other Lions from clubs surrounding Fond du Lac also transport tissue for the eye bank. Weber was at a recent meeting to present Betty Clausen with a Knight of Sight Fellowship for her service to eye banking. $1,000 was donated by the Lions to the eye bank in her honor. The Lions Eye Bank of Wisconsin, located in Madison, would like to invite area residents to join us, along with the Fond du Lac Evening Lions and Fond du Lac Lioness Clubs in “Dining to Donate” at one of thirty-eight Wisconsin Hospitality Group (WHG) owned Applebee’s locations to help support National Eye Donor Awareness Month. Fifteen percent of your dinner will be donated to the Lions Eye Bank of Wisconsin when you dine or carry out on Monday, March 17th. You must bring a flyer to the restaurant to have the proceeds donated to the Lions Eye Bank of Wisconsin. The flyer can be printed from Lions Eye Bank of WI website, along with a listing of locations at lebw.org. It is also available on the FDL Evening Lions Club’s site at fonddulaclions.org. What is National Eye Donor Awareness Month? A month devoted to honoring eye donors and corneal recipients, and increasing awareness of the need for eye donations. The eye banking community promotes the month of March as National Eye Donor Month in order to encourage eye donation in the communities that we serve. The first National Eye Donor Month was observed in 1983 as a result of a proclamation read by President Ronald Reagan designating March as an opportunity to raise awareness of the need to donate eyes, to recognize donors and their families, and to celebrate recipients. Since then, a member of Congress has continued the tradition and reads a proclamation into the Congressional Record each March.